Almost 20 years after that rain and emotion-drenched night when Hong Kong returned to Chinese rule, the last colonial governor Chris Patten revisited his old haunts and proved as incisive, insightful – and newsworthy – as ever, as a sell-out FCC audience discovered. Jonathan Sharp reports. Hong Kong’s last British colonial governor Chris Patten gestures as he speaks at the Foreign Correspondents Club in Hong Kong on November 25, 2016. According to the billing for his appearance at the FCC, Patten was going to give his views on what the world was like, and could expect, following this year’s two seismic electoral shocks, the UK’s pro-Brexit referendum vote and Donald Trump’s victory in the US presidential election. But if any of those who packed into the Main Dining Room thought that Patten was going to stick to that script and not hold forth on the fraught political environment in his old bailiwick of Hong Kong, then they were in for another shock. In fact it was his trenchant views on what he termed the oath-taking “antics” in the Legislative Council by activists favouring Hong Kong’s split from China that made headlines, not just locally but also back in the UK. Patten, who during his 1992-97 governorship sought to quicken the pace of political reform and was excoriated by Beijing as a “sinner for 1,000 generations”, emphasised that he remained as devoted as ever to the cause of full democracy for Hong Kong. He also admired the Umbrella Movement that blocked some Hong Kong streets for 79 days in 2014. Chris Patten arrives at the FCC with his wife, Lavender (left), and FCC President Tara Joseph (right). Understandably, the localists did not take Patten’s stern admonishing lying down. Leung told the Guardian that he and his Youngspiration party “respectfully disagreed with Lord Patten’s comments about the so-called ‘moral position’” of the 2014 protests, adding that the past two years had proved that a strong moral position yielded nothing “when you are negotiating with the immoral and authoritarian Chinese communist party”. Who loses under Brexit and Trump? Lord Patten’s talk at the FCC made headlines both in Hong Kong and the UK. The seemingly tireless 72-year-old Patten enlarged on this and many other themes at a succession of events during his Hong Kong visit. 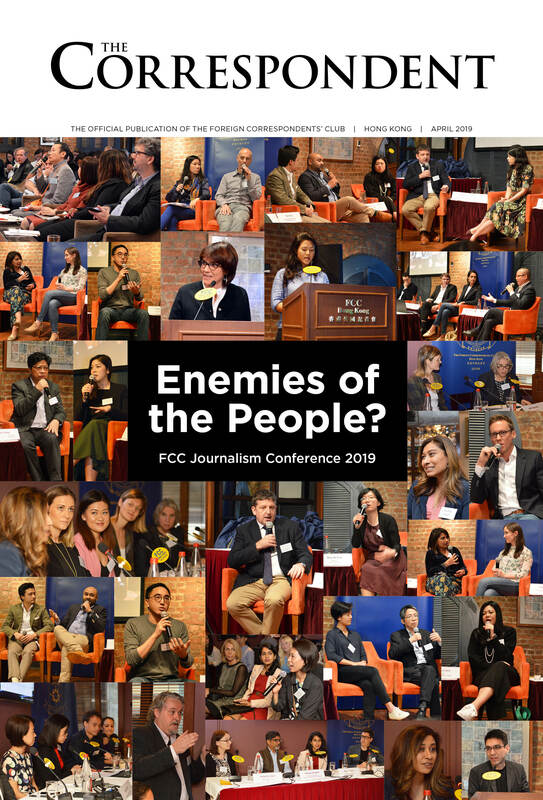 The day after his FCC appearance, he attended a Project Citizens Foundation forum entitled “Governance in Hong Kong: Are the Pillars Crumbling?” He said that during his career he had worked with several different bureaucracies – in the UK and Europe as well as Hong Kong. “Without any question the most competent civil service that I worked with was that in Hong Kong in the 1990s. I hope it has not lost any of its vitality and morale since then.” The unequivocal response came from Anson Chan, the former Chief Secretary before and after Hong Kong’s handover to China, who told the forum in no uncertain terms that Hong Kong’s civil service had indeed gone downhill in many sad ways since she had been in charge. Patten also said that his five years as Hong Kong governor were “the happiest years of my life”. And many Hong Kong people accord him a warm welcome whenever he comes back and gives us the benefit of his wisdom laced with dry wit. Which makes one wonder: how many other former governors of colonies, British or otherwise, are held in the same esteem in the territory they used to run as is Hong Kong’s last “colonial oppressor” – Patten’s joking term for himself?